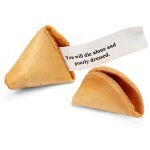 – Tasty fortune cookies with evil, cruel, and funny fortunes inside. 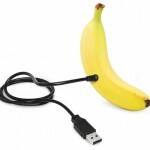 – Wrappers are blank to blend in with any restaurant decor and surprise your target. – 10 cookies per package – each with a different fortune (though if you buy multiple packages, you might get repeats). Each time you reach for a tissue from the Ah-Choo Talking Tissue Box, it imitates your illness with one of six sneezing and coughing sounds. 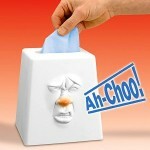 They say laughter is the best medicine so with the Sneezing Tissue Box you’ll be better than new in no time. 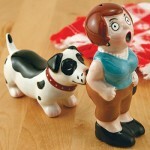 A great way to welcome your guests when they come by the house. 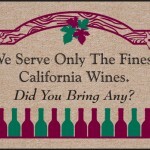 The doormat says it all… “We Serve Only the Finest California Wines. Did You Bring Any?” and it pretty much tells them what kind of state you’re in. 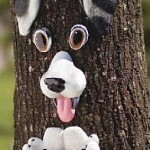 Just attach ears, eyes, nose, mouth and birdseed-holding paws to any wall, fence or tree. 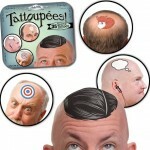 Only $8,95 per set!